Preheat oven to 450 degrees. For later in this recipe, place a cooling rack over a large dish or pan. In a large cast iron pan, or other oven-proof sauté pan (do not use a non-stick skillet), heat the oil over medium high heat until hot. 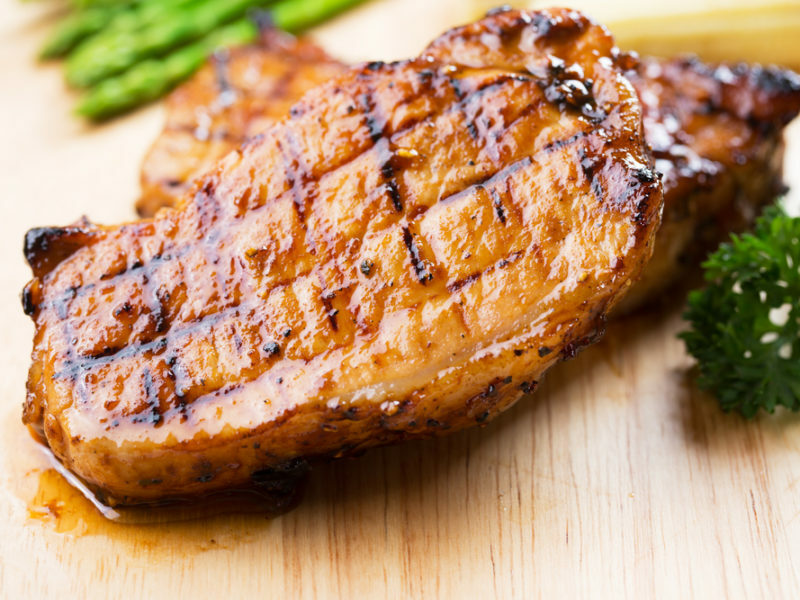 Place the two chops in the pan, not touching each other, and let them cook – leaving them alone for three minutes. Turn and cook untouched for two more minutes. Then keep flipping every two minutes for about 10-12 minutes or until golden brown. Remove the pan from the oven and set chops temporarily on the prepared rack. Drain off oil from the pan and discard. Place the pan on stove top over medium heat and add butter, garlic and thyme. Cook for two minutes, scraping up any brown bits, then add the chops back to the pan and baste continually; flipping the chops two or three times to fully coat with butter sauce, about two to three minutes. Turn off the heat. Remove the pork chops to the rack again and let rest for 10-15 minutes. Cover loosley with foil.